Fats, sugar, and salt are addictive and if we keep going back to eating food that is not good for us, we know that we are in the habit of it. To break it, replace it with good food that is really tasty. The key word is “tasty”. Laying out a bowl of celery and carrot sticks is not going to kick it unless you are a rabbit. Eating well takes time and planning. We have to really get into it and prepare for those times when we want to indulge ourselves. For me, this seems to be every weekend. I can get through the week without much of a problem. I am busy working and have evening plans but when the weekend comes, I want to relax and enjoy my time off. Eating delicious fun food is a big part of what I enjoy over the weekend. Popcorn has always been my go-to snack food but there are lots of other snack foods that won’t break the diet bank. Use lettuce or collard leaves to hold chopped vegetables mixed with good fats like guacamole and seasoned with herbs and spices, or rice and beans topped with a spicy sauce. Collard greens can be split and rolled up like cigars. Lettuce leaves are more like cups. If you like soda, try replacing it with a fruit smoothie made with juiced watermelon. 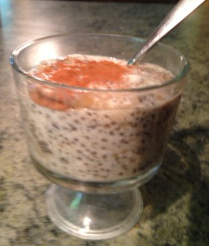 If you are into cakes and pies, indulge in this delicious chia pudding recipe my girlfriend gave me. Take a small custard cup and line the bottom with banana slices. Sprinkle about three tablespoons of chia seeds over the bananas, add a few raisins, and fill it with almond milk. Let it set over night to thicken, then stir, and enjoy. Frozen peeled bananas is another great treat for the sweet tooth in you. Peel and cut into thick slices to freeze them. Eat them like candy. Taking a little time and effort to plan healthy snacks can be fun, a lot more fun than grabbing the nearest bag of taste-sensation foods like chips and dip. Bags of snack foods might be quick and easy but they are made to give your mouth a burst of flavor not nutrition, they easily cause over-eating (“You can’t eat just one,” as they say), and add extra pounds. Eating stuff like this can give you a nighttime stomach ache. Bad habits need to be dealt with, especially negative habitual thoughts. Thinking the same negative thoughts over and over again can have an effect on our overall well-being. We can be our own worst critics. As my husband often points out, we can think and say things to ourselves that no one else would ever dare say. How cruel we are in our own thoughts. How will we ever break free? Thank goodness for Jesus Christ! From Him we have the keys to the Kingdom of God that is within us. His promises and the hope he gives in the New Testament is water for the thirsty soul dragged down by the disappointments in life and a mind full of constant criticism. The New Testament is not just words but power for the mind and hope for the heart. He loves us just as we are and He will lead us out of the darkness of our thoughts and into the light of His. Jesus promises us this transformation, and it can happen quickly. Do you have repeating thoughts that trouble you? Give them to Christ, tell Him what you are thinking. They are only thoughts, not reality. Do you have an image in your mind that frightens or shames you? God has given you an imagination to imagine Him, not these evil things, so show it to Christ and let Him take it from you. It is only an image, it is not real. These thoughts and images are common to most people and are like poisoned arrows flung at us to bring us down. Put up the shield of faith against them. Read Christ’s words of life in the New Testament, and think on His words of love and hope instead.